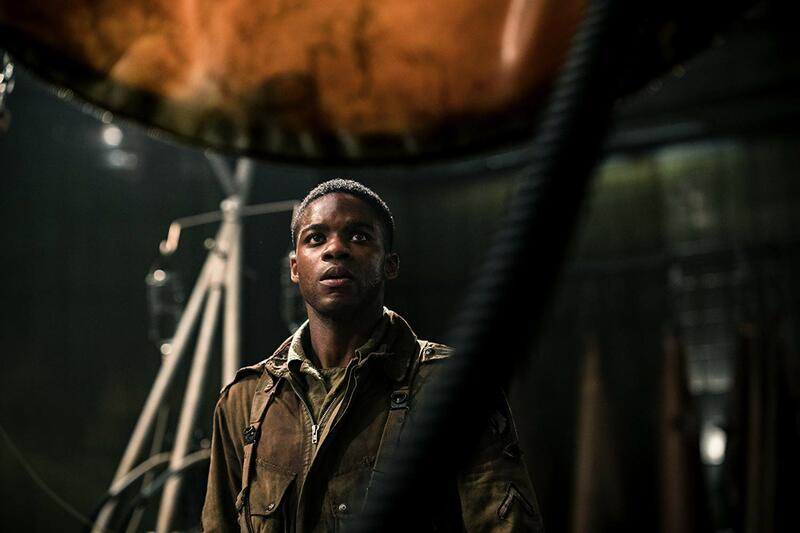 Jovan Adepo stars as Pvt. Boyce in "Overload," a film produced by J.J. Abrams. “Overlord” is a new action/horror film directed by Julius Avery, who is probably more known for his upcoming “Flash Gordon” film than anything he’s released so far. While the content of the two films is likely to be quite different, “Overlord” left me feeling encouraged as to the potential of the Gordon film. “Overlord” has the feel of a high budget B-movie that executes everything pretty well, even if it doesn’t do anything super unique. “Overlord” follows a group of soldiers who are dropped behind enemy lines on D-Day. The unit has been tasked with destroying a radio tower, located in a small French town, so that the air support will be able to reach the beaches with less resistance. Upon arrival to the town, things get a little more complicated than anticipated. Pvt. Boyce (Jovan Adepo) sneaks into the church that holds the tower controls to find that the Nazis are conducting deadly experiments on their captives. Boyce regroups with his unit, determined to return to the church to destroy the tower and the devilish experiments beneath. The film hits the ground running, opening with perhaps the most thrilling sequence of the film. The soldiers are just minutes away from parachuting out toward their desired location. Each member of the platoon gets a few lines that quickly establishes the character trope each falls under—the paragon of virtue, the over talkative New Jersian and the mysterious silent guy. Things go wrong quickly, as bullets pierce through the plane immediately killing one member. As things go haywire, the camera does a great job of establishing the cramped space, leaving the audience feeling trapped alongside the soldiers. The camera begins to shake as the plane falls apart, leaving me almost as confused as those on screen (in a good way). While this was my favorite scene, the rest of the film did well enough to keep me entertained. It doesn’t take long after that for the film to plant the seeds for what is going down in the church basement. The film uses such seeds to help sprout the horror vibe well through the first hour or so. The church features some truly disturbing moments of body horror, effective in both furthering the mystery and making me squirm. They even throw in a few jump scares, thankfully not going overboard. The end of the film switches to a more action heavy tone. There are really only two or three ‘monsters,’ so don’t get your hopes set on a run and gun style. Instead the film utilizes chase scenes, tense one-on-one battles and a few nice explosions to help take out the Nazi’s guarding the church. And flamethrowers. Flamethrowers are always fun to watch. I felt that the film dragged a bit in the middle. The film gave me some nice leads on the mysteries of the church in that first hour, but the 30 minutes until the film turns on the action left me in a lurch. I knew the film had to answer my questions about the church and I wanted it to very dearly, but instead they try on focus on the dismantling of the tower for what I felt was a bit too long. Once the action started kicking off, I was once again satisfied. Though there were a few times I felt that the 40-50 guards the film says are in the church had all taken their breaks at the same time because only 10 ever seemed to face the protagonists. Those protagonists did as solid a job keeping me engaged as the story did. Boyce is the one the film spends the most time with. He’s the new guy who doesn’t really like killing and is the moral compass of the film, constantly doing ‘the right thing.’ It could be to the point of announce for some, but as a certified lame-o I enjoy paragon characters. The rest of the characters, no matter how long we spent with them, also never leave their stereotypes. Still, they felt believable as I watched the film, and I felt invested regardless of their lack of depth. That’s probably the way to describe my feelings on the film, too: nothing here felt new, or really surprised me—save some of the body horror moments in the church. Neither the story, nor the characters were deep, yet through some very solid execution at almost every level of this film, I found myself enjoying most of the two hours I spent in the theater. If everything in October couldn’t quench your thirst for horror and film violence, consider this to satisfy your palate. William T. Sherman once said “War is Hell.” However, things could somehow be worse. Sherman probably never considered the factor of Nazi-manufactured zombies into the equation of war. That’s the premise of the new horror action film from maverick Hollywood producer, J.J. Abrams, titled “Overlord” – a film that reenvisions the hours leading up to the D-Day invasion about a troop of five American soldiers trapped behind enemy lines fending off a wave of Nazi’s and their ungodly re-animated creations. In the film, Russell plays rogue paratrooper and top-tier explosive expert, Cpl. Ford. Ford is positioned as the gruff and tough leader of the quintet of stranded soldiers after their plane is shot down over a small Nazi-occupied french town. “Overlord” is like if John Carpenter directed “Re-Animator” and “Saving Private Ryan” into a blender of dark humor, excessive gore, and big thrills. Russell, the son of Hollywood legends Kurt Russell and Goldie Hawn, says he mostly decided to come on board the project due to the involvement of J.J. Abrams and Bad Robot Productions. While the film takes place over the course of just six hours, the actual production took around three months to complete. While some movie sets can be rough, Russell has mostly fond memories from his work with the cast and crew of “Overlord” (besides an unfortunate case of Mono during production). “Overlord” is in theaters now.